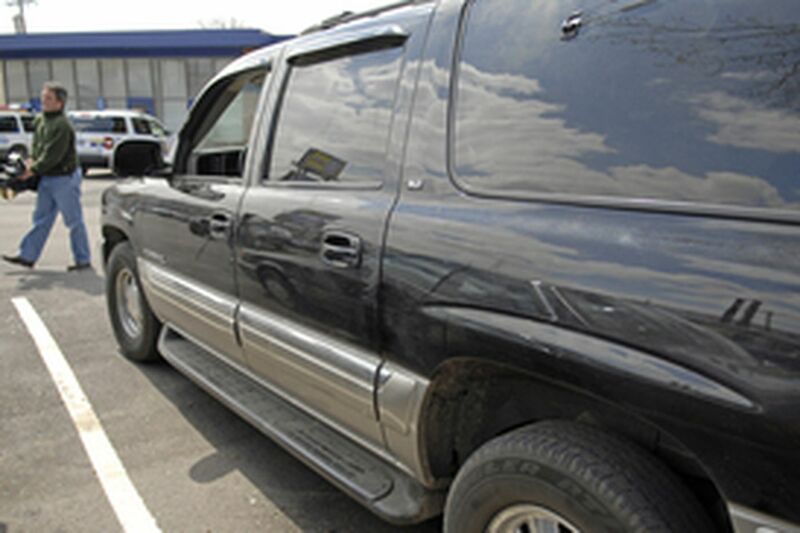 A TV cameraman walks past GMC Yukon impounded by the police after West Philadelphia shooting death of Charles Baldwin. One of the city's top cops made an urgent plea yesterday for the public's help in tracking down the gunslingers who killed a loving, hardworking father of four who was hit by a stray bullet in his West Philadelphia home Friday night. "This is the ultimate in terms of a tragic situation and our appeal at this point is to any of the neighbors who may have seen something that evening to come forward," said Chief Inspector Joseph Fox of the slaying of Charles Wayne Baldwin. Fox said there were at least two gunmen involved in a shootout down the street from Baldwin's home on Pine Street near 58th. Baldwin, 42, was hit in the head by a bullet that streaked through the window of his second-floor bedroom while he was getting dressed for work. Police have a man in custody who is being questioned about what happened that night. Fox said the man, who was suffering from a gunshot wound, walked himself to Misericordia Hospital shortly after 7 Friday night. "By his own admission he was in the vicinity at the time of the shooting," Fox said. He is being held on other unrelated charges as of now, Fox said. Police are looking at other possible suspects, but Fox wouldn't elaborate. Police said the gunfire erupted at about 7 that night, but Baldwin's body wasn't found until about four hours later by a friend. The shootout started outside a home at 58th and Pine streets, about eight houses down from Baldwin's. Fox said at least three shots were fired. "We have every reason to believe that this was a drug-related confrontation," Fox said. "There was a black Yukon with Delaware tags parked on 58th Street, and the individuals who were inside or in the vicinity of that Yukon played a significant role in this incident," he said. "Evidence recovered from that vehicle clearly indicates it was more or less into illegal drug sales." Fox blasted the court system for not properly dealing with the thugs who have taken over the streets of Philadelphia. "Every one of the people that we are looking at in connection with this incident has an extensive and violent criminal past," Fox said. "I'm of the firm belief that if the right thing had been done any one of the times that they were arrested, this tragedy would have never happened." Fox said to the residents of the block where Baldwin was killed that he understands and sympathizes with the fear they are experiencing and the hesitancy they have in coming forward. However, he said the consequences will be far worse if people don't start stepping up. "These thugs are peddling death and destruction on these neighborhoods, and we have to start encouraging people to step up so that they can take their neighborhoods back."